Parkinson's disease (PD) belongs to a group of diseases that are referred to as neurodegenerative because they involve the degeneration and death of neurons. In PD a group of structures called the basal ganglia, which play a role in facilitating movement, are predominantly affected. 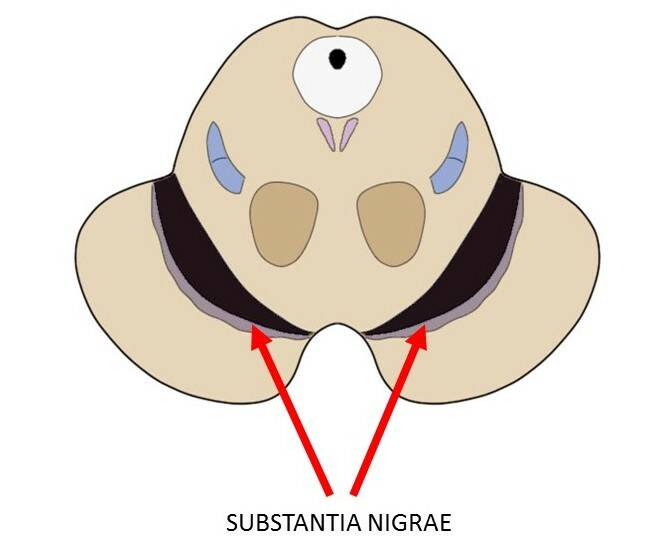 The substantia nigra, one of the basal ganglia nuclei as well as one of the most dopamine-rich areas in the brain, is severely impacted; by the end stages of the disease patients have often lost 50-70% of the dopamine neurons in this region. This excessive loss of dopamine neurons and the accompanying depletion of dopamine levels in the basal ganglia are associated with increasingly debilitating movement-related symptoms, such as rigidity, tremor, bradykinesia (slow movement), and postural impairment. The most common method of treating PD involves the administration of L-DOPA. L-DOPA is a precursor to dopamine that the brain can use to synthesize more of the neurotransmitter; thus, it works to increase the dopamine levels that are being continuously reduced by the disease. PD, however, is progressive, meaning that neurodegeneration will continue once it has begun. L-DOPA isn't capable of halting neurodegeneration, and eventually the dopamine synthesized from L-DOPA is not enough to replace all that has been lost due to the disorder; with time L-DOPA begins to lose its effectiveness. Especially in the later stages of PD, L-DOPA provides diminishing returns, and the side effects of chronic L-DOPA treatment start to make its continued use more detrimental than beneficial. Therefore, we continue to seek out treatments for PD that will be more effective in the advanced stages of the disease (while maintaining a manageable side effect profile). In the early 1990s, it was observed in non-human primates that lesions of the subthalamic nucleus (STN) appeared to effectively eradicate Parkinsonian symptoms. Although the reason for this was not fully understood, a hypothesis was formulated based on the understanding that one of the functions of the STN seems to be to inhibit unwanted movements. Normally, this suppression of movement should only occur when a movement is not desired, and thus the interference should be removed with the attempt to initiate movement. In PD, decreased dopamine levels may prevent another structure in the basal ganglia, the globus pallidus, from moderating activity in the STN. This can lead to excessive STN activity, which serves to overly-inhibit movements and may cause the difficulty in making movements that characterizes PD. Based on this rationale and related experimental evidence, the STN was identified as a potential therapeutic target in PD. At that point, though, the only way to reduce activity in the STN was through a surgical procedure that irreversibly destroyed the nucleus. However, not long after the STN was identified as playing a role in PD symptoms, a new method of influencing activity in the STN (and other brain areas) was developed: deep brain stimulation (DBS). This method was tested in patients with PD for the first time in the mid-1990s. The results were encouraging, as in some cases symptoms improved drastically and the patients were able to reduce their dose of L-DOPA and related drugs significantly. An example of the marked improvements that can occur after DBS is initiated can be seen in the video to the right. Since the first experimental DBS procedures, the method has been used with thousands of patients, making it an established therapeutic approach for the treatment of advanced PD. DBS involves the insertion of an electrode into the brain. Thus, it requires an invasive surgical procedure that necessitates making one or two holes in the skull. An electrode is placed in the desired region of the brain (in the case of PD usually the STN but also sometimes the globus pallidus); the electrode is connected to a wire that runs under the skin to a device called a pulse generator, which is usually implanted under the collar bone. When the pulse generator is turned on, it emits electrical impulses that seem to disrupt neural functioning. This can be used to cause changes in brain activity that resemble what happens when a lesion has been created. Thus, implanting an electrode near the STN and turning on the pulse generator reduces excessive activity in the STN; the abatement of STN activity is associated with an improvement of symptoms. Although the DBS procedure has seen some success in alleviating symptoms in patients with advanced PD, the mechanism by which it achieves those effects is still unclear. DBS in the STN does reduce STN activity in patients with PD, but it is uncertain why stimulation of a brain region would have effects similar to the ablation of that brain region. Several hypotheses have been put forth to explain the mechanism of DBS, ranging from the assertion that DBS causes changes in neurotransmitter and hormone levels to the proposition that DBS disrupts abnormal neural oscillations in the brains of PD patients. This latter hypothesis has perhaps received the most research attention as a mechanism of DBS, and is considered by some to be the most viable explanation. The term neural oscillations describes rhythmic changes in the electrical activity of neurons and can involve fluctuations in the membrane potential of an individual neuron (i.e. action potential) or a small population of neurons (i.e. local field potential). These neural oscillations in certain areas of the brain tend to exhibit patterns of synchronization, which means that the activity of different neural populations becomes regulated on a similar timescale. In other words, synchronized neural populations may (on average) fire action potentials at the same time, then be at rest at the same time. It is thought that these synchronized patterns of neural activity are used to facilitate communication and integrate activity among groups of neurons from different parts of the brain, and thus normal oscillatory behavior may be essential for diverse functions ranging from sensory perception to motor movements. There are several different rhythms of oscillatory activity that can be detected throughout the brain; they range from low frequency delta oscillations (1-4 Hz) to high frequency gamma oscillations (>30 Hz). What makes understanding the effects of neural oscillations even more complicated is that these different frequencies of oscillations can be linked, or coupled, together in such a way that different areas of the brain with different patterns of oscillatory activity seem to work in concert with one another by coordinating their disparate oscillatory behavior. For example, a peak in the activity in one region might coincide with a valley in the activity of another. This mechanism, known as phase-amplitude coupling (PAC) may allow for the syncing of activity across a variety brain regions in a dynamic manner, and is becoming recognized as a key feature of healthy cognition. Patients with PD display abnormally increased oscillatory activity in the STN in the beta frequency (13-30 Hz), which has been hypothesized to disrupt the normal functioning of the basal ganglia in such a way as to impair movement. And, some studies have found that the reduction of this oscillatory activity may be one mechanism by which DBS alleviates the symptoms of PD. However, the signal for voluntary movement originates in the motor areas of the cerebral cortex, and it remains unclear how abnormal beta oscillations in the basal ganglia might influence the motor cortex in such a way as to produce the movement-related symptoms of PD. Thus, it is also unknown how the stimulation provided by DBS might affect the motor cortex to alleviate those symptoms. In a recent study published in Nature Neuroscience, de Hemptinne et al. (2015) explored the hypothesis that DBS helps to improve the symptoms of PD by reducing excessive coupling of neural oscillations in the motor cortex. In non-PD patients, PAC between high- and low-frequency oscillations in motor areas of the brain occurs when at rest and is reduced when movements are made. It has been suggested that this coupling may inhibit neural activity until movement is initiated; at that point the coupling is diminished so movement can occur. de Hemptinne et al. hypothesized that in PD patients, the PAC is exaggerated and continues to inhibit movement even when a movement is desired. DBS, however, may act to reduce PAC and increase the possibility of movement execution. To test this hypothesis, they used a procedure called electrocorticography in PD patients before, during, and after DBS stimulation of the STN. Electrocorticography (ECoG), also sometimes called intracranial electroencephalogram (iEEG), involves the placement of electrodes directly on the surface of the brain to record the electrical activity of neurons. Although this is an invasive surgical procedure, the patients in the study by de Hemptinne et al. were already undergoing surgery for the placement of the DBS electrode and thus an additional surgical procedure wasn't required. In this study, the electrodes for ECoG were placed directly on the sensorimotor cortex. As the authors hypothesized, the ECoG recording before the DBS device was turned on showed excessive beta frequency activity in the STN as well as exaggerated coupling of beta activity with gamma frequency oscillations in the motor cortex. Patients at this point displayed characteristic PD symptoms like rigidity, tremor, and bradykinesia. When the DBS device was turned on, however, the abnormal PAC in the motor cortex was reduced and symptoms were alleviated. Additionally, the degree to which PAC was reduced was associated with the degree to which the patients' symptom severity was mitigated. Thus, it appears plausible that DBS reduces PD symptoms in part by reducing PAC in the motor cortex. DBS is still considered a last-resort option for most PD patients, as it does involve invasive surgery and all the associated risks, and it is not successful for everyone. However, if we can come to fully understand the mechanism by which it works, we may be able to refine the method and improve its success rate. For example, if PAC in the motor cortex is to blame for the severity of some of the symptoms of PD, future DBS devices could incorporate real-time monitoring of PAC and the automatic adjustment of stimulation to most effectively reduce it. As we uncover more information about the mechanism of DBS, it may become a treatment for PD that can eventually replace L-DOPA which, despite its therapeutic value, remains a temporary solution to the problem. Regardless of the improvements we make to DBS, however, it still does not seem it will be capable of permanently arresting the neurodegeneration that occurs in PD. Thus, the search will continue for a therapeutic approach to treating the symptoms of PD that can at the same time either slow or stop the relentless loss of basal ganglia neurons that defines the disease.